Richard Kellerman and Alix Kocher are co-founder and current CEO, respectively, of Nielsen Kellerman (NK), a company that produces sports performance monitors and weather instruments. 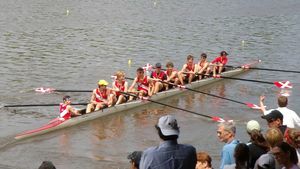 The company was started in 1978 by Kellerman and Paul Nielsen – co-workers at Xerox Corporation – after Rowing Coach Ted Nash from the University of Pennsylvania brought broken pieces of rowing equipment to them, leading Kellerman and Nielsen to devise their own products for the sport of competitive rowing, eventually creating the CoxBox. The company has expanded to manufacture not only rowing equipment, but other sports products as well as weather instruments used in various circumstances such as firefighting. In this interview, Kellerman and Kocher discuss the development of the original CoxBox, from inception to prototype to manufacture. They talk about the difficulties involved in creating such an instrument because of its need to be both waterproof and extremely durable. The topic of patents in business and development is covered. Engineering education is also discussed, particularly because NK designs and manufactures its products, making a wide-based engineering knowledge essential. Interview #498 for the IEEE History Center, The Institute of Electrical and Electronics Engineers, Inc.
Richard Kellerman and Alix Kocher, an oral history conducted in 2009 by Robert Colburn, IEEE History Center, Hoboken, NJ, USA. Basically what I would like to do is focus on the story of how the CoxBox® came to be and also some of your background, what prepared you for being in that rather unique position of being the ones to build it. I would like [to] go back and hear the story about how Coach Ted Nash asked you to do it and all that sort of thing. I can tell you that. I'll do that bit. I assume that's running. Okay. Paul Nielsen and I worked together at Xerox Corporation in the corporate research labs, and we both had an interest in starting our own business, but we had no idea what to do, so couldn't think of anything. And it was an accident. Ted Nash was the coach of the University of Pennsylvania. I knew him socially. As soon as he found out that I could fix things -- or at least my partner could -- he started appearing with this broken stuff that they were using in rowing. And I took it to my partner, and he can fix anything, and he'd fix them, one after the other. Kept on fixing them, and we'd charge $50. [Laughter] And eventually Paul said, I can make these things. I can actually design one that would work and wouldn't break. So that's how he got started, literally. They used megaphones. They had big megaphones – they were yelling into those. They were struggling, holding stopwatches, and they were also trying to measure the cadence, the rate. So typically, a coxswain would go out with a stopwatch taped to one leg, and they were all sweep hand stopwatches. And a stroke watch, which was also a sweep hand and required you to count the number of strokes, taped to the other leg. And then the megaphone, which of course obscures their view. And they're supposed to be steering at the same time. They were supposed to be steering and calling race strategy. And so some people that were part of Ted's group had—they called it the lunch box. They'd made this sort of assemblage of stuff that was an amplifier system. It broke all the time. And the stroke rate measurement part of rowing, they hadn't even thought of incorporating that. So we designed something that replaced all the junk in that box and would actually hold up. It was the electronics that, at the time, actually, was cutting edge. You don't look like you're old enough to know this, but we used the original RCA C-MOS chips. It was a discreet, eight-pin, dual in-line packaged chips. We couldn't export the CoxBox® at the time because it was proprietary. The biggest challenge other than the electronics was sealing it. These things get used by spoiled brats who don't pay for them themselves. They abuse them. They're under stress because they're competing. It has to be waterproof, drop-proof and everything else, so that was a challenge. But we got it right. And we had to do the in-the-boat part, which stays in the boat in all weather, all circumstances. The speakers and the wiring and the rate sensors all get installed into the boat with the kids then stepping on them and left in the boathouse all winter. Rowed in saltwater and rowed in freshwater, and all of those pieces have to work together. The microphone also has to be waterproof. You still, to this day, if you go to regattas, you see kids carrying the CoxBox® by the microphones. So even though it's not military — it was an introduction to MILSPEC manufacturing. You basically have to be MILSPEC to handle what these kids do. And subsequently, that knowledge has carried over to all of our products, and it's part of the reason why the weather instrument Kestrel line also wound up being successful, because that knowledge of how to make durable outdoor products carried over. Oh, I'll tell you a nice story. The first one that broke—I never forgot that. I was mortified. I mean, somebody called up. It doesn't work. No, how can that be? And they'd taken it apart, which shocked me. But the good news is the guy who took it apart was some kind of ham radio guy, and he told his coach—he said, this thing is amazing. It's really well-built and put-together, and that was a nice thing to hear that, and it's true. It was, and we still make them. We sold tens of thousands of them. This thing needs a fair amount of power, and it's sealed, so putting batteries in and out every single day was not practical, so we had to do rechargeable batteries, rechargeable battery circuitry. All of that stuff was pretty cutting-edge; there weren't many things that worked that way. There's a reason that that design got updated pretty substantially about seven or eight years later, and then we ran with that design for another twenty years. Yeah, the original one was a four-inch diameter can. The four-inch outside diameter was dictated by the fact that the holder was a section of cut-off PVC pipe with a four-inch inside diameter. So that's why they were that size then, and they still are now. We've come a long way. We no longer use PVC pipe. We use an injection molded cup, but that's how it started. But we still have to make a four-inch product. We just redesigned it fully. And it’s still a four-inch circle because now all the boats have the holder. Right. And the competitors have to do the same thing, too. It's like standards always evolved in bizarre ways and this is how this—that's where that one came from. But the original standard was a piece of cut-off PVC pipe. It worked beautifully. So it was the mechanics, not the electronics dictating. Yes, it was. That's right. How long did it take from the idea to the point where they could be the first working prototype? An amazingly short period of time, and I wish we could do that now. We take longer and longer to develop anything now. It's because technology's just become so much more complex. But I think Paul and I—I would say it was months from inception to building the first one. And I would say, with a team of three engineers it has taken years to make the most recent CoxBox®. The board was laid out manually. You know, Richard first built the light table. I had to build the light table to lay the mylar film on, to lay out the tape but it still only took months. And Paul Nielsen and I were both working at Xerox at the time. Now, we weren't building them yet. As soon as you start building them and change the design, there's more to it. The building of the device itself takes up your talents, but the design of the first product is sort of a petty creative phase where you don't have a lot else on your mind, and you don't make any money until you get it done. You should ask us about the Concept2® business at some point because that's an interesting business. It was critical. Whenever that works for you. Yes. I wanted to ask about when you brought the first ones down to Ted Nash, what was his reaction? How did his coxswains react? Yeah, they really did. I remember the first order that came in was from Syracuse University, and that also was a shock—I don't know how—I suppose you had to expect orders, but somehow it came as a surprise. And then once they started selling, they started selling fast, and we were making hundreds of them pretty quickly. And it stayed in the basement for seven years, I think. You know, it wasn't like the iPhone. I mean, we're not selling, you know, tens of thousands overnight, but it was an impressive thing for us. We were delighted. Yeah, at that point, we started seriously thinking about maybe we won't stay at Xerox, and we'll make a business out of this, but that took several more years and a couple more products. Connectors, yeah. Alix is right. The speaker wire and charger connectors have always been a problem. This is another standard forced upon us. The only connector we could afford—we couldn't afford circular and mil-C connectors, which is what we should've used. So we used a rubber connector made by Amphenol that was designed basically for car trailers. It wasn't even designed for bulkhead mounting, which is what we were doing. But we still use the damn thing now, 50,000 units later. We can't change it because all the boats have got the plug. In fact, we now mold our own, we use enough of them, but it's still basically the same old design. So yes, the connectors were always a problem. All the way down. All 30 feet of it and wreck the whole thing. So we designed a custom, solid machined pin, and it's gold-plated to resist corrosion. And those are proprietary to us at this point. It's one of the reasons why our wiring in the boats last a lot longer than anything anybody else has done so far. Yes, I think the biggest problem was maintenance. We couldn't—we simply couldn't design it so that the user could replace the battery. So basically, you know, every couple of years, every three years, every one of them had to come back, and it was never simply a question of changing the battery. Other stuff would go wrong, and that had to get fixed. So we wound up doing significant maintenance business too, which is tough to make money on. If you really charged people what it costs, they weren't happy. But it was a remarkably trouble-free product, given the abuse it took. And it absolutely has to be reliable. These kids, they all train 100 hours for every hour that they race. It's like any sport; you spend 100 times the time training than you do actually racing. So the last thing they want is to have our product fail on the biggest day of their life, so it had to be very, very reliable. Yes, and they are. I have taken mine to Istanbul. That's right. Of course, I'd forgotten. You were a coxswain. It's traveled very well. And so tell me about the Concept2®. That was a breakthrough piece of business for us. Concept2® makes a rowing machine, an ergometer. And I approached them. At the time, they were using a mechanical tachometer from a bicycle to monitor. So I said, look, we make an electronic monitor that'll give you more meaningful data. Well, my partner, bless him, came up with a really inspired idea. He used to drive a Saab—a two-cycle Saab with an overrunning clutch, and he had figured out that you could calculate the dissipation of that car by taking your foot off the accelerator, knowing what the car weighed, and timing how long it took to slow down. So he immediately realized that on this big, spinning fly wheel, you could do the same thing. And in closed form, you could calculate the dissipation. And that's what he did. And instead of having a meaningless number on a mechanical tachometer, we could display to the nearest watt, the amount of power that the rower was dissipating on that ergometer. It was a huge success. We sold hundreds of thousands of them, and we—the biggest single mistake we made, we did not patent that. And then eventually they found they could get it made for less somewhere else, and they did. And that was difficult. Talk about technology and sport, so that was 1982 or 1983. And we enabled the measurement of power output by that point. And, really, in the last three years, that has turned into a major area of study in the development of training. What, 20 years ago? Yes. Yes, and the next step, which is much harder, but there's a lot of demand for it, is figuring out how to measure that in a rowing shell. So that's—you know, there's still plenty of—there's big frontiers for further technology in electronics in rowing and power output, the force output, all those things - - measuring in a rowing shell. It's just, there's a lot of moving parts. And there's just—there's a lot of technological hurdles to do it, to figure out the best place to do it. And it pretty much requires wireless data transmission because it's just more wires than—there are some people that have been doing it with wired setups and it's just way too much wires and connectors. That's limiting the ability to do it, but, you know, that's something we figured out how to do in—on this rowing machine twenty years ago. Subsequently, now, they do it basically the same way on bikes. They measure it in the hub, the rear hub of the bike, and they use that power output to set targets for the athlete's training. Yes, that is a very big -- a huge -- development. But, you know, even heart rate training, which was—has been sort of huge for the last fifteen years or so, heart rate training is an indirect way of trying to do the same thing. You're measuring it by the body's physiological response to the dosing. But that's not consistent. It's not as consistent as if you can measure the dosing itself because as you go through a workout, your heart rate—your heart works harder to get the same power output. So really, what you should be doing, if you're trying to get a consistent physiological impact, is to be reducing the work at that stage in the workout. To be able to really, truly measure the power you're putting in, and in the—and the bike is changed by wind and rain and friction of the tires, and in a rowing shell, it's changed by the efficiency of the boat, the efficiency of the crew, wind the terrain doesn't change all that much. Water's generally flat. You can't go uphill on water, but wind makes a huge difference. You can't go uphill. You can go up-current, but you can't go uphill. So the great successes are always the seeds of the great failures, and we'd lost the Concept2® business. And that almost put us out of business. It came very close because it was approximately 60% of our volume and 90% of our profits. So, we lost it. We got reasonable warning. They had a lot more trouble than they thought they would copying it, so we got a breathing space. We went down to our last penny developing a new set of rowing products and we succeeded, or, or I wouldn't be telling you this today. And the weather instruments. The whole lot came out. That burning platform of losing Concept2® was also the genesis of looking around for other things to build, and that was the source of the weather instruments, which is—some of them, same technology in terms of measurement systems that we use in the water, directly translated over to the weather instruments, the spinning impeller, we use the water impeller in the water and air impeller in the weather instruments, but they work exactly the same. Right, we were dealing with fan LAWS in the Concept2® ergometer because it dissipated power with a fan, and we were dealing with fan LAWS with anemometers, too. Our, our first product was just the wind meter but what took us out of the mundane into a really powerful business in the weather instruments was relative humidity. And Richard and Paul figured out how to use a sensor that is basically designed and predominantly used in Mercedes and BMW HVAC systems as an affordable, reasonably accurate sensor. But because of the way we package it and use it and calibrate it, we get very accurate performance. And it turns out that there were a whole lot of people that needed a quick and convenient way to measure relative humidity - - firefighters being the first group that really caused our business to take off. They were carrying a whole collection of equipment to measure wind speed, temperature and relative humidity. Those three things are the primary predictors of the behavior of a fire. So they go all around any given fire, and they measure those three things. Well, we made something the size of a cellphone that replaced a whole set of equipment and gave you all three readings instantly. I mean, it's now just basically required equipment for wildfire firefighters. That's what they learn how to use in fire academy. They also learn to accept the inaccuracies and errors associated with sling psychrometry. So when you give them an instrument that gives the right answer, their first reaction is, it's wrong. My way of doing it must be correct, but we've finally educated them. So, yeah, that's been a great product for us. And again, you know, the other reason we're a success in that business is those products are completely waterproof. They float. They're really durable, and all the people that are using them are using them outdoors in very difficult conditions. And it should be added that they're also, by the standards of the price of the instrument, they're extremely accurate. We had a nice story from an Air Force forward weather observer who had one of our Kestrels®, and the base had a $100,000 fixed weather station, and he was using this little handheld device. He said, it's remarkably accurate, and tracks very, very closely, and he said, it's a pity it's so expensive. Well, you know, it was, $350, and he's comparing it to $100,000 worth of equipment, but, so, they're very good. And, you know, Paul and I have our engineering and scientific background, you know, obviously predisposes us to making accurate instruments if we can. We got smarter. We have five patents. Yes, we learned that lesson. We now patent everything we can. And they are—the way we do the measurements is what's unique about the product. Well, the other thing that's, if not unique, it's unusual. We make them all here. Most of this kind of stuff gets made in China, so, for a variety of reasons -- not all of them business -- we don't like that. So we make them here. Make money doing it as well. That is excellent. That is a very impressive accomplishment. Have, have you shown him—has he been around here? Okay. Well, Alix will show you around after this. Yes, I would definitely like to do that as well. All along, we've made—we've manufactured everything. We've—and so, in terms of technical challenges of our design, we are also designing to facilitate manufacture in our facility. So everything from the parts we're selecting for the boards, and the way the boards will be populated and the way they'll be assembled, it's designed to take advantage of the way we build things here. And we also design to not have problems. You know, we avoid potting or encapsulation like the plague because that does not fit in with our manufacturing process. You wind up with, you know, huge stacks of stuff waiting to solidify. So if we can possibly avoid that we do. Yes. There's a lot of synergy between the engineering and manufacturing because they're all under the same roof all familiar with the same problems. It keeps us from making the same mistakes twice. Well, at least three times. That's right. A fairly infinite number of new mistakes to make, but if we didn't have that corporate knowledge I don't know how we'd get the next new thing – and there is plenty of new. There's plenty of new in rowing. There's plenty of new in the weather instruments. We're very fortunate to have a long list of ideas that our customers are asking us for as well. We could use more engineers. Richard and Paul are a chemist by training and a physicist by training. But each have taught themselves a broad range of engineering skills and that is getting to be very difficult to find. As technology gets more demanding, people specialize more. You almost have to specialize more, but then being able to think in terms of how is this going to fit into a manufacturable product that really meets the customers' needs, that becomes the challenge. You know, it's easy to look at discrete little pieces of technology, be it wireless communication or the ability to measure or certain kinds of displays and be excited about them, but then figuring out how they're all going to fit together, balancing the compromises of power demand and power sources and light weight and sealability and all that kind of stuff. That's a very interesting aspect to, to go into because that's—the education of engineers is obviously a big priority with IEEE, so that's very interesting to hear that. There should be a mandatory minor requirement that all electrical engineers study physics and they don't. Because it's extremely useful, and Paul's and, to a lesser extent, my knowledge of physics have been enormously helpful. You know, physicists have a, you know, reasonably simple way of looking at the world, at least, you know, that part that's local and you can frequently solve and avoid problems that trap engineers that are not so trained. So yes, give them a minor in physics. There's challenges at both ends of the spectrum for a company of our size. It's also a challenge to stay aware of the technology that's becoming available, some of which is remarkably affordable. And not just stay, we know how to do a lot of things in a way that works, but we don't ever push ourselves beyond that. We could get left behind, and the company that seizes on a completely new way of doing something will perhaps take these things in a completely different direction. So we have to be aware of what's going on out there while still not losing sight of the practical things that we know about how things work. We hired two electrical engineers in the last couple of years, and both of them had the solid electrical engineering knowledge base, but they'd also actually made stuff, been involved in the complete design of a product and, and in a small enough company that they'd seen all the aspects of it instead of just being a very narrowly-defined. Yes, and a small company does not have the luxury of having an engineer who can just do a piece. A specific kind of digital circuit. I mean, we need somebody that can do anything, and they're increasingly hard to find, for obvious reasons. And it almost—it almost can't come purely out of the education system. They either have to be a person that has been a tinkerer their whole life, or has put their knowledge to practical use, or had had an opportunity to work for another company and seen the way things fit into the bigger picture. I do all the recruiting for the company. It's amazing that more people still aren't doing engineering. It seems to me that most other companies I talk to, when they're hiring, that's still the category that they have difficulty getting enough good applicants for positions. Well, there's a reason for that. For the last fifteen years, most smart young people have been getting degrees in finance, and you can hardly blame them. Hopefully that'll now change. I think it is changing. So, we need smart engineers, a lot of them. Well, I mean, I'm very opinionated about the education system, but I don't know how to address that. I think I'd like to tell electrical engineers that they should very seriously consider working for themselves if they can possibly do it. It's very satisfying. It can work out well. You learn a lot, have a lot of fun. And sometimes change the world. It’s extremely valuable to somebody who's not having to run around with heavy equipment. You can succeed at a much smaller level and still have a very satisfying job. There are sixty people here, building, designing, selling and supporting the things we've designed. So it's—that's pretty satisfying. So that's the one that got towed behind the boat trailer sixty miles, and it still works. And then the taller can was where we started. And then they were able to shrink that considerably. That was partly battery pack technology, batteries got a lot better. But you can see the big, honking capacitors on that thing now. You know, now those are tiny. And those, those were all—every capacitor, resistor was hand-placed, and through hole components and clipped off and soldered, and now that all gets done, you know, on the Quad machine. We use all surface-mount parts. The impellers and the StrokeCoaches®. And then that was the original Chronostroke®. That was the second product, was the coaches stopwatch. Actually, I think this—the metal can StrokeCoach® might be the second product, and then the stopwatch. The stopwatch got redone into this watch, and that StrokeCoach® got redone into the rounded rectangle product. And then that got extended into the speed-measuring products. The PaceCoach® actually used very interesting technology. It used Faraday Technology to measure water speed. It had the advantage of the impeller not fouling on things like that, but it also has a disadvantage of you have to run a wire to it. The advantage of the impeller is that we can put the pick-up on the inside of the hull and the impeller on the outside, and not have anything through the hull. And then that concept led to the same way that the water meter impeller works. That impeller is not connected to the unit at all. You can just pop it out, and it has a small magnet on it that generates a pulse that's picked up by the unit. The Kestrel 4000® added data logging capability to the current measurements, which makes it a remarkably multipurpose unit, and it gets used for everything from long-range shooting ballistics calculations, the firefighting market, to hazmat response. It gets used in research a lot. It's a really affordable tool for almost any experiment, whether it's animal behavior or plant environment, or paint performance or anytime you need to record environmental conditions. And, you know, the researchers look around for something that's an affordable way to do that. We pop up a lot. We sell to a lot of different scientific and technical applications. I mean, there's also interesting stories. Apparently one guy had it inside of an experiment that involved blowing or, or using liquid nitrogen to cool down the environment, and his—something broke, so it started spraying liquid nitrogen snow through the system for, like, 15 minutes before he could shut it down. The Kestrel® was pelted with liquid nitrogen snow. And he said everything else broke. Absolutely every other piece of equipment in the system broke except for the Kestrel®. It was fine. That is definitely a testimony to reliability. Yes, very, very tough. Now, they're not fireproof. We have had a number of firefighters send us pictures. They tend to hang them in the tree and leave them there recording temperatures. And if the fire goes a different way than they expected, they leave the Kestrel®. And then they melt. So that's, that's the only thing; we haven't figured out how to make them fireproof. They're pretty heat resistant, but full-blown fire, they do melt. 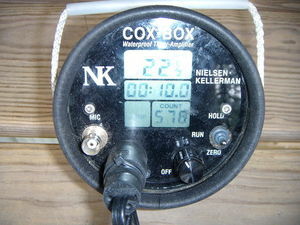 Actually, the CoxBoxes® there was a boathouse in Washington State last year. That boathouse got hit by a tornado, and everything got picked up, and you know, just the boats got shattered. A lot of their boats were stored outside because it's generally pretty benign weather. And we contacted them right afterwards, and offered to donate equipment to them to get their program back up and running. They said, well, actually, we found all of the CoxBoxes and all of the SpeedCoaches, and they're all fine. They all had been picked up and scattered around the area, but when they found them all, they all worked. This page was last edited on 15 January 2015, at 17:57.